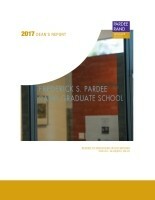 In this report from the dean to the Pardee RAND Graduate School Board of Governors, Dean Susan Marquis shares information about the new cohort, recent graduates, alumni highlights, events, dissertation awards, the year in fundraising, updates to the curriculum, and more. Marquis, Susan L., 2017 Dean's Report: Report to the Board of Governors. Santa Monica, CA: RAND Corporation, 2018. https://www.rand.org/pubs/corporate_pubs/CP716-2017-12.html.